Ahhh! 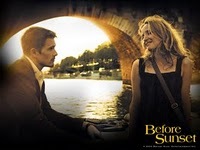 "Before Sunset" with Ethan Hawke and Julie Delpy was just on Cinemax. I LOVE this movie—it contains one of my favorite scenes EVER. If you haven't seen it, stop reading this post now, because I'm going to talk about it, so SPOILER ALERT! I LOVE the final scene, when Jesse and Celine go back to her apartment. I LOVE when she plays the guitar and sings to him, "Let me sing you a waltz..."
I LOVE when she imitates Nina Simone and dances.